Popski's Private Army, officially No. 1 Demolition Squadron, PPA, was a unit of British Special Forces set up in Cairo in October 1942 by Major Vladimir Peniakoff. Popski's Private Army was one of several raiding units formed in the Western Desert during the Second World War. The squadron also served in Italy, and was disbanded in September 1945. 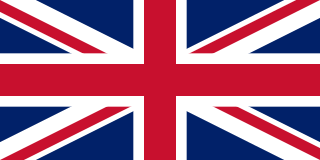 The United Kingdom (UK), officially the United Kingdom of Great Britain and Northern Ireland, and sometimes referred to as Britain, is a sovereign country located off the north-western coast of the European mainland. The United Kingdom includes the island of Great Britain, the north-eastern part of the island of Ireland, and many smaller islands. Northern Ireland is the only part of the United Kingdom that shares a land border with another sovereign state, the Republic of Ireland. Apart from this land border, the United Kingdom is surrounded by the Atlantic Ocean, with the North Sea to the east, the English Channel to the south and the Celtic Sea to the south-west, giving it the 12th-longest coastline in the world. The Irish Sea lies between Great Britain and Ireland. With an area of 242,500 square kilometres (93,600 sq mi), the United Kingdom is the 78th-largest sovereign state in the world. It is also the 22nd-most populous country, with an estimated 66.0 million inhabitants in 2017. Cairo is the capital of Egypt. The city's metropolitan area is one of the largest in Africa, the largest in the Middle East, and the 15th-largest in the world, and is associated with ancient Egypt, as the famous Giza pyramid complex and the ancient city of Memphis are located in its geographical area. Located near the Nile Delta, modern Cairo was founded in 969 CE by the Fatimid dynasty, but the land composing the present-day city was the site of ancient national capitals whose remnants remain visible in parts of Old Cairo. Cairo has long been a centre of the region's political and cultural life, and is titled "the city of a thousand minarets" for its preponderance of Islamic architecture. Cairo is considered a World City with a "Beta +" classification according to GaWC. Major is a military rank of commissioned officer status, with corresponding ranks existing in many military forces throughout the world. No. 1 Demolition Squadron was formed specifically to attack Field-Marshal Rommel's fuel supplies, in support of General Montgomery’s offensive at El Alamein,  at the suggestion of Lieutenant-Colonel John Hackett. The unit became operational on 10 December 1942 as an 8th Army Special Forces unit. After the Long Range Desert Group (LRDG) and the Special Air Service (SAS), PPA was the last and smallest of the three main irregular raiding, reconnaissance and intelligence units formed during the North African Campaign. The Second Battle of El Alamein was a battle of the Second World War that took place near the Egyptian railway halt of El Alamein. 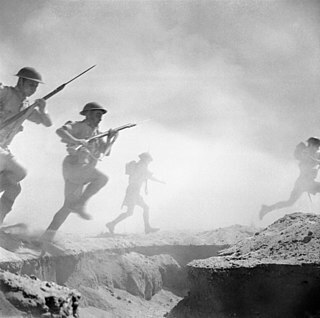 The First Battle of El Alamein and the Battle of Alam el Halfa had prevented the Axis from advancing further into Egypt. General Sir John Winthrop Hackett, was an Australian-born British soldier, painter, university administrator, author and in later life, a commentator. The Long Range Desert Group (LRDG) was a reconnaissance and raiding unit of the British Army during the Second World War. Sir Christopher Frank Carandini Lee was an English actor, singer and author. With a career spanning nearly 70 years, Lee was well known for portraying villains and became best known for his role as Count Dracula in a sequence of Hammer Horror films, a typecasting situation he always lamented. 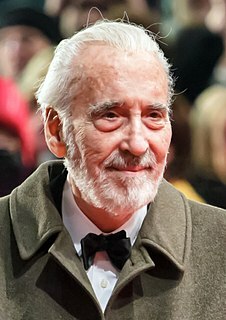 His other film roles include Francisco Scaramanga in the James Bond film The Man with the Golden Gun (1974), Saruman in The Lord of the Rings film trilogy (2001–2003) and The Hobbit film trilogy (2012–2014), and Count Dooku in the second and third films of the Star Wars prequel trilogy. The Royal Air Force (RAF) is the United Kingdom's aerial warfare force. 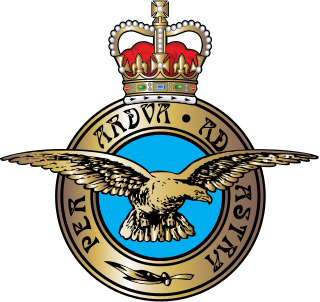 Formed towards the end of the First World War on 1 April 1918, it is the oldest independent air force in the world. Following victory over the Central Powers in 1918 the RAF emerged as, at the time, the largest air force in the world. Since its formation, the RAF has taken a significant role in British military history. In particular, it played a large part in the Second World War where it fought its most famous campaign, the Battle of Britain. The Jebel Akhdar is a heavily forested, fertile upland area in northeastern Libya. It is located in the modern shabiyahs or districts of Derna, Jabal al Akhdar, and Marj. On his return to Cairo in the middle of 1942, Peniakoff was invited to join a Long Range Desert Group (LRDG) raid in the area he had just left. In doing so, he learned much about their procedures, but also lost his left little finger to an Italian bullet. He was awarded the Military Cross (MC) for his previous intelligence reporting and petrol dump raiding while leading the LAFC for three months behind enemy lines, and for the operation with the LRDG. While he was away, the LAFC was disbanded. He was given the nickname Popski, from a Daily Mirror cartoon character,  by Captain Bill Kennedy Shaw (the LRDG's Intelligence Officer) because his signallers had problems with "Peniakoff". A nickname is a substitute for the proper name of a familiar person, place, or thing - commonly used for affection. The Daily Mirror is a British national daily tabloid newspaper founded in 1903. It is owned by parent company Reach plc. From 1985 to 1987, and from 1997 to 2002, the title on its masthead was simply The Mirror. It had an average daily print circulation of 716,923 in December 2016, dropping markedly to 587,803 the following year. Its Sunday sister paper is the Sunday Mirror. 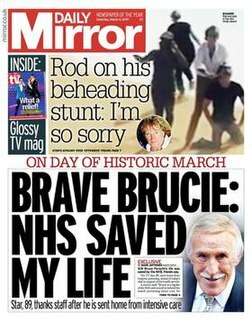 Unlike other major British tabloids such as The Sun and the Daily Mail, the Mirror has no separate Scottish edition; this function is performed by the Daily Record and Sunday Mail, which incorporate certain stories from the Mirror that are of Scottish significance. Shortly after this No. 1 Demolition Squadron was formed, the smallest independent unit of the British Army at 23 men all-ranks. The original officers of the unit were three friends who had served together in the Libyan Arab Force: Popski, Robert Park Yunnie and Jean Caneri. Vladimir Peniakoff with his jeep during the raid on Barce. Peniakoff was asked to give the new unit a cover name, but vacillated. The unit's name ultimately came from Hackett's exasperation at Popski's delay: "You had better find a name quick or we shall call you Popski's Private Army"—"I'll take it". PPA was unusual in that all officer recruits reverted to lieutenant on joining, and other ranks reverted to private. The unit was run quite informally: there was no saluting and no drill, officers and men messed together, every man was expected to know what to do and get on with it, and there was only one punishment for failure of any kind: to be immediately returned to unit. It was also efficient, having an unusually small headquarters. Events proceeded rapidly; the Germans and Italians were expelled from Egypt and Libya shortly after PPA became active. A joint LRDG-PPA patrol discovered the gap in the mountains that let Bernard Montgomery launch an outflanking move around Erwin Rommel's defense at the Mareth Line. The PPA was also among the first elements of Eighth Army (moving west) to linkup with the British First Army and American II Corps (advancing east) in Tunisia in early 1943. Many PPA raiding and reconnaissance operations were carried out around the time of the battle of Kasserine Pass, including taking the surrender of 600 Italians. The summer of 1943 was spent in Algeria and Tunisia recruiting and training new volunteers from the LRDG, SAS, Commandos and Royal Armoured Corps for the fight in Italy, bringing the unit's size up to about 35 all ranks, with two fighting patrols and a small HQ. For a short while PPA experimented with using 1st Airborne Division's gliders to deliver them and their jeeps behind the Axis lines in Sicily, but their part in that operation was cancelled at the last minute. In September 1943 an advance patrol of PPA sailed to Taranto on board the USS Boise  and headed inland, where they discovered the hitherto unknown weakness of the German 1st Parachute Division opposing 1st Airborne. As a result of this success Popski was allowed to increase the size of PPA to 80 all ranks; throughout the Italian Campaign about 100 men were actually deployed at any one time. Three fighting patrols, each of 18 men in six jeeps, and one Tactical HQ patrol of four jeeps were formed and given great autonomy. Each jeep was armed with .50in and .30in machine guns, giving the patrols immense firepower for their size. The men trained hard for amphibious, mountain and parachute operations, demolition and counter-demolition, reconnaissance and intelligence gathering. They were deployed in many roles, often clandestine, and for several months even operated as regular front line troops, holding a sector of the Allied front line, badly depleted after the withdrawal of forces for the D-Day landings in Normandy, nipping around in their jeeps to fool the Germans into believing that they were opposed by much larger units. Several operations used DUKWs or small landing craft called RCLs (manned by 7 Royal Engineers who became known as "Popski’s Private Navy") to sail up the Adriatic and get behind the German front line, escorted by the Royal Navy’s Coastal Forces. Throughout the bitter winter weather and fighting of 1944 and 1945 PPA undertook their operations ahead of regular forces, in support of British, Canadian, Indian and Polish armoured, infantry and commando units. They located targets for the Allied Air Force, chased Germans out of rear-areas, saved bridges, captured many prisoners and guns, and accepted the surrender of the entire German garrison at Chioggia. At various times PPA worked alongside other secret units such as the LRDG, SAS, No. 1 Special Force (SOE), Phantom, ‘A’ Force and Office of Strategic Services. Along the way they adopted many strays, including Russian, Italian and German POWs, Italian regulars and partisans, both royalist and communist. Popski was awarded the Distinguished Service Order (DSO) in November 1944, during joint operations (such as “Porterforce”) with the 27th Lancers and Italian partisans of the 28th Garibaldi Brigade, to liberate Ravenna. Shortly afterwards he lost his left hand to a German rifle-grenade. At the end of the war Popski’s Private Army sailed some of their jeeps on RCLs to Venice, where they drove around St. Mark's Square, the only wheeled vehicles ever to have been there. The unit was disbanded four months later on 14 September 1945, after hunting for Himmler, disarming Italian partisans and discouraging Josip Broz Tito’s partisans from encroaching on Austrian and Italian territory. By this time PPA personnel had gained between them a DSO, a Distinguished Conduct Medal, 6 MCs, 10 MMs, and 14 Mentions in Despatches; King George VI had personally requested an account of the unit’s exploits. 1 2 Peniakoff, 1950. p. 204. ↑ "Christopher Lee talks Special Forces and receives an incredible gift"
↑ Peniakoff, 1950. p. 46. ↑ Peniakoff, 1950. p. 94. ↑ Morison, Samuel Eliot (1944). History of United States Naval Operations in World War II. : Sicily, Salerno, Anzio, January 1943-June 1944. Little, Brown. pp. 235–236. ISBN 9780252070396 . Retrieved 24 February 2015. This text is adapted from the "PPA Story" on two plaques at the PPA Memorial in the Allied Special Forces Grove at the National Memorial Arboretum. This list includes the first edition of each of 'the big five' books on PPA, starting with Popski's own bestseller. Since the early editions are hard to find, a recent edition is also listed for each book: where these have been retitled, the changed title is listed. Peniakoff, Vladimir (1950). Private Army. Jonathan Cape. --- Private Army. Jonathan Cape. 2nd Edition, foreword by General Sir John Hackett, minor revisions, 1951. --- Popski's Private Army. Cassell Military Paperbacks, 2004. ISBN 0-304-36143-7. Translated into Swedish (1951), German (1951), Italian (1951), French (1953), Hebrew (1954), Spanish (1955), Serbo-Croat (1957). Yunnie, Park (1959). Warriors on Wheels. Hutchinson. --- Fighting with Popski's Private Army. Greenhill Books, 2002. ISBN 1-85367-500-8. Owen, Ben (1993). With Popski's Private Army. Janus Publishing. --- Astrolabe Publishing, 2006. Available from the Friends of Popski's Private Army. Willett, John (1954). Popski, a life of Vladimir Peniakoff. MacGibbon and Kee. Signalman Les White, signaller in "S" Patrol. White, Les (2004). From the Workhouse to Vienna. Cassell Military Paperbacks. ISBN 0-304-36143-7. Captain John Campbell, leader of "S" Patrol. Rayment, Sean (2013). Tales from the Special Forces Club. Collins. ISBN 978-0-00745-253-8. Friends of PPA online part of the PPA Memorial, Official Register of PPA Personnel, PPA Roll of Honour, PPA Awards, PPA War Establishments and other information. PPA Preservation Society personnel database, photos and information. Special Forces Roll of Honour awards, images and links for many units including PPA. Popski's Private Army a comprehensive synopsis of the PPA story, by Allen Parfitt. BBC News story about the 2007 discovery in the desert of a bag lost by an LRDG despatch rider (incorrectly thought to be a PPA despatch rider) during the war. books about PPA listing the 5 major books in all their editions, and details of unpublished books. A technical is a light improvised fighting vehicle, typically an open-backed civilian pickup truck or four-wheel drive vehicle mounting a heavy weapon, such as a machine gun, anti-aircraft gun, rotary cannon, anti-tank weapon, anti-tank gun, ATGM, mortar, howitzer, multiple rocket launcher, or recoilless rifle, operating similar to a light (unarmored) military gun truck. The term technical is a neologism. In professional military parlance a technical is often called a non-standard tactical vehicle (NSTV). Lancelot Speed was a British illustrator of books in the Victorian era, usually of a fantastical or romantic nature. He is probably most well known for his illustrations for Andrew Lang's fairy story books. Speed is credited as the designer on the 1916 silent movie version of the novel She by H. Rider Haggard, which he had illustrated. Patrick Andrew Clayton DSO MBE was a British surveyor and soldier. He was the basis for the character of Peter Madox in The English Patient. Operation Agreement comprised a series of ground and amphibious operations carried out by British, Rhodesian and New Zealand forces on Axis-held Tobruk from 13 to 14 September 1942, during the Second World War. A Special Interrogation Group party, fluent in German, took part in missions behind enemy lines. Diversionary actions extended to Benghazi, Jalo oasis and Barce. The Tobruk raid was a disaster and the British lost several hundred men killed and captured, one cruiser, two destroyers, six motor torpedo boats and dozens of small amphibious craft. 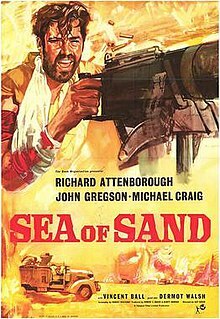 Sea of Sand is a 1958 British war film starring Richard Attenborough, John Gregson and Michael Craig. The film, which was directed by Guy Green, is about a patrol of the Long Range Desert Group (LRDG) during the North African Campaign in the Second World War. 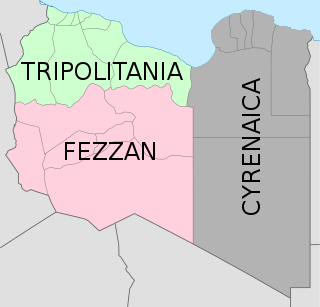 It was shot on location in the Kingdom of Libya. The Special Interrogation Group (SIG) was a unit of the British Army during World War II. It was organized from German-speaking Jewish volunteers from the British Mandate of Palestine. The SIG performed commando and sabotage operations against Axis forces during the Western Desert Campaign. Major Roy Alexander Farran DSO, MC & Two Bars was a British soldier, politician, farmer, author and journalist. He was highly decorated for his exploits with the Special Air Service (SAS) during World War II. Farran became widely known after being court martialled on a charge of murdering an unarmed 16-year-old member of the Jewish underground militant group Lehi during his command of an undercover Palestine Police unit. After his brother was killed in a revenge attack, Farran emigrated to Canada where he forged a successful business and political career, holding a seat in the Legislative Assembly of Alberta from 1971 to 1979 sitting with the Progressive Conservative caucus. He served as a cabinet minister in the government of Premier Peter Lougheed during that period. Play Dirty is a 1969 British war film starring Michael Caine, Nigel Davenport, Nigel Green and Harry Andrews. It was director Andre DeToth's last film, based on a screenplay by Melvyn Bragg and Lotte Colin. The film's story is inspired by the exploits of units such as the Long Range Desert Group, Popski's Private Army and the SAS in North Africa during World War II. Lieutenant-Colonel Vladimir "Popski" Peniakoff was the founder and commanding officer of No. 1 Demolition Squadron, PPA, colloquially known as "Popski's Private Army", during World War II. A long-range penetration patrol, group, or force is a special operations unit capable of operating long distances behind enemy lines far away from direct contact with friendly forces as opposed to a Long Range Reconnaissance Patrol, a small group primarily engaged in scouting missions. The Sudan Defence Force (SDF) was a locally recruited British-led force formed in 1925 to assist the police in the event of civil unrest, and to maintain the borders of British administered Sudan. During the Second World War, it also served beyond the Sudan in the East African Campaign and in the Western Desert Campaign. Major John Geoffrey "Geoff" Appleyard was a British Army officer, who served in the Commandos and Special Air Service during World War II. The Capture of Kufra/Prise de Koufra was part of the Allied Western Desert Campaign during the Second World War. Kufra is a basin and oasis group in the Kufra District of south-eastern Cyrenaica in the Libyan Desert. In 1940, it was part of the colony of Libia Italiana, which was part of Africa Settentrionale Italiana (ASI), which was established in 1934. The battle, resulted in the capture of Kufra by Free French Forces and the British Long Range Desert Group from the Italian and Libyan garrison. 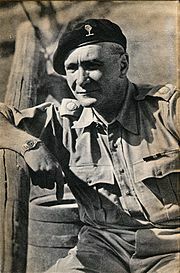 Paolo Caccia Dominioni, born in Nerviano, Lombardy, 14th Baron of Sillavengo ; was an Italian soldier; officer in Alpini mountain Infantry Corps; engineer and writer, most noted for his leadership in the North Africa Campaign in World War II. Operation Caravan was a subsidiary of Operation Agreement under which four simultaneous raids were carried out against important Axis Lines of Communication positions in September 1942. Edward "Teddy" Cecil Osbaldeston Mitford was a British officer in the British Army during the Second World War and after. He was an explorer of the Sahara desert before the war which was instrumental in his becoming one of the original members of the Long Range Desert Group. He later commanded five armoured regiments and an armoured brigade. He was also a member of the Mitford family from Northumberland. Auto-Saharan Companies (in Italian Compagnie Auto-Avio Sahariane were special Italian units of desert warfare operating in Libya and Sahara desert during Second World War. Their military operations took place in Egypt, Libya and Tunisia, until the surrender of Italo-German forces in May 1943.